Individual Bacteria or Virus Solution Bottles - Perelandra Ltd.
We can't emphasize enough how important the Virus Solution and the Bacteria Solution are, and why you'll want to take both daily, year-round. Climate change has changed the world's health. The global microbial population is adjusting and migrating to new areas, causing new and more difficult problems for humans. Unfamiliar microbial patterns are flying around the globe and modifying rapidly as humans pass things around. The bottom line: We are in a new world. Machaelle and nature answered the challenge, and in August 2017, we announced this extraordinary development. 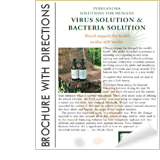 The Perelandra Virus and Bacteria Solutions offer broad support for health in this new world. Still, we're determined to get across to you how important these two Solutions are, and why you'll want to take both daily. In the Microbial Balancing Program Workshop, Machaelle presented extensive facts and references about how microbes are affecting our global health. She commented that she wouldn't be surprised if scientists started linking all kinds of illnesses to microbes. That was in 1999. Since then, scientists' understanding of microbes has grown. We're reading new articles regularly about microbes and how they link to common illnesses. The health impacts have blown up exponentially. Machaelle has understood for a long time that most health issues, serious or not, are likely activated by microbes. The patterns of the Virus and Bacteria Solutions zero-in where things first go off the rails. They provide a targeted monitoring, and they disrupt and eliminate "microbial misbehavior." Each pattern is working from the perspective of a different group of microbes (hence the distinguishing "virus" and "bacteria" in the names). So break out of your notion of what the old "Seasonal Balancing Solution" could do. That's still in there, but these two Solutions provide much broader, deeper and different coverage. This is a whole new ball game! The Virus and Bacteria Solutions are for humans only. They are not to be given to animals or plants. These Solutions do not contain any virus or bacteria. They contain an electric pattern infused in water and preserved with either brandy or distilled white vinegar. Also, if you too are friends with your microbes and protective of the little buggers, you'll be happy to know: No viruses or bacteria were harmed in the making of these Solutions! Under normal circumstances, take one time daily. When addressing a specific issue or heightened activity in your area, take twice daily until the issue is fully addressed or activity has passed. Adult dosage for each Solution is 10 drops. Children up to 12 years old — take 5 drops per dose. Don't take them at the same time as other Perelandra Solutions or Essences (except when they're part of a PIC Unit). Don't eat or drink anything 10 minutes before, or 10 minutes after. If you're taking both of them, you can take them at the same time, just wait 10 seconds between each dose. Don't mix them together. If you're on the once-daily dosage track, you can take your dose(s) any time of day. If you're taking your dose(s) twice daily, you'll take your first dose in the morning and the second dose in the evening. Can a dose be diluted? If you're an adult or teenager (13 years old and up) — no, you cannot dilute these Solutions. For children 12 years and younger, each dose can be diluted and administered separately. The ratio is 15 drops of Virus or Bacteria Solution into 2-oz. (or less) of tepid water. The child must drink all of the water. Which Solution replaces the old, annual Seasonal Solution? Ideally, both of them: Virus and Bacteria. But if you choose to take only one at this time, start by taking the Virus Solution. 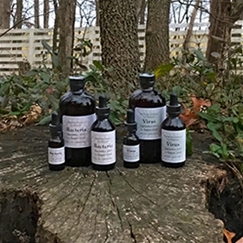 Is there any overlap between the Nature Program V1, V2, B1 and B2 Essences and the Virus Solution or Bacteria Solution? No. The Solutions are doing something completely different than the Essences. Is there any problem with taking the Bacteria Solution when I'm also taking an antibiotic? No. The Solution is doing something completely different than the antibiotic. Would the Virus Solution help with _______? Yes. If you're considering this question, give the Solution a try. Would the Bacteria Solution help with _______? Something (anything) has SNAFU'd health-wise. Take both Solutions, twice daily. Something has SNAFU'd health-wise, you know it's microbial and you know it's a certain group of microbes. Take the one that applies twice daily. You're surrounded by people who are going down before your very eyes, you know it's microbial and it's spreading. Take the specific related Solution, or both if you're not sure, twice daily. If you have a kid going to school (a.k.a. germ factory), once daily doses of each Solution will serve you and your children well. If you're looking for full seasonal coverage, take both. You shop in crowded or popular stores, or malls. You are visiting a friend in the hospital. You or your kids spend time in a gym, locker rooms, community swimming pool, etc. You or a parent live in a poly-amorous senior retirement community. Take both daily. You travel outside of your usual environment. Take both daily. You use public transportation (bus, train, taxi, Uber). Take both. You are traveling by plane or meeting friends or business associates in airports. You stay in hotels when traveling. You're having surgery or just had surgery, or you receive regular medical treatments. There's an outbreak of _____ [insert the name of the pathogen or disease galloping your way] and you would like to strengthen and prepare for possible exposure. And finally, it bears repeating . . . If something (anything) has SNAFU'd health-wise for you, take both of these Solutions twice daily. Getting the idea? Like we said, the Virus Solution and Bacteria Solution each have remarkably expanded patterns. Be sure to include these two Solutions in your PIC List testing. We've updated the PIC checklist, to download and copy for free as needed, here. More good news: There is a good chance that taking these two Solutions daily will simplify your PIC List testing results. This is different: If you are doing a PIC test for your animals, the environment or a soil-less garden, these two Solutions should NOT be included in the testing. Skip them on the checklist. Read more about the microbial impact on health and the environment. 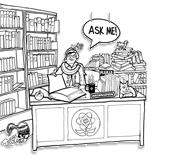 And check out our "Did You Know?!" Series! When Machaelle developed the Virus and Bacteria Solutions last year, she wasn't sure how they were going to play out. Were the patterns going to hold from year-to-year? Or would the patterns change each year as Seasonal Balancing Solution did in previous years? The original Virus Solution patterns and Bacteria Solution patterns included the possibility for no change. But Machaelle wanted to beta test the new Solutions for this first year. We now know the patterns in the Virus Solution and Bacteria Solution will not change this year. If you currently have Bacteria and Virus Solutions, you can continue to use them past August. They won't need to be tossed out or changed out in September. You can safely ignore the "September 2017-August 2018" on the label.